If you prefer to have a camel accompany us to carry your luggage for the day we can arrange this for you. More information on the mayor sites can be found on the Wadi Rum desert sites page. At 10 AM we meet each other in the visitor centre. From here we start our trekking. We first head for Um Salab. While on our way, we can admire the famous mountain called Seven Pillars of Wisdom. Once we get close to Um Salab we change our course and head for the beautiful Wadi Um Ishrin. Around lunch time we go to a quiet and shady place. We take a few hours break. Like we will do every day. We prepare you a Bedouin lunch. After we finish our lunch there is time to take a rest or walk around to explore the area on your own. In the afternoon we continue our trekking and soon leave beautiful Wadi Um Ishrin. We have plenty of time to watch the beautifully shaped mountains. We walk through beautiful canyons to the south side of Burrah canyon where we stay overnight in a cave. We cook you a traditional Bedouin dinner. The evening can be spent around the fire. We can tell you about Bedouin culture and music or you can gaze into the starry night sky and enjoy the peaceful silence of the desert. Like the coming days you can wake up to the rising sun or you can wake up earlier to see the sunrise. We prepare you breakfast. After breakfast, we head to Mushroom rock. We make a short stop to watch this wind-shaped rock. We continue our walk all the way to Jabal Burdah. Here we take our lunch break. In the afternoon we climb up to Burdah rock bridge via one of the Bedouin roads. The climb is not so difficult. In a number of places, you might want to use your hands. And close to the bridge are the most difficult areas. For safety reasons, we use ropes here. 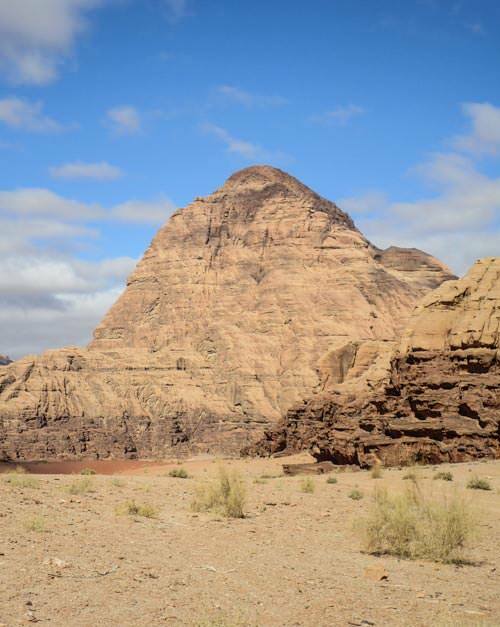 At the top, you have a fantastic view over Wadi Rum desert. After taking the time to enjoy the views we start our descent. We walk to the south side of Jabal Burdah and stay overnight in this area. Once our stomaches are filled with another breakfast we start today’s program. In the morning we leave the Burdah area and walk to less visited Um Gharisha. Here we enjoy the spectacular big valley views. At a nice and quiet place, we have our lunch break. We prepare you lunch and we take the time to relax. In the afternoon we leave Um Gharisha and start to walk towards Jabal Al-Hash. While on our way, we pass through yellow sand valleys dotted with desert vegetation. Near Jabal Al-Hash we have dinner and stay overnight in a cave. After breakfast, we start our first climb, Jabal Al-Hash. This climb is easy. The views of both the north and the south of Wadi Sabet are stunning. This hike also gives you a unique opportunity to discover fossils on top of the mountain. After taking our time to enjoy the views we start our descend towards Wadi Nuqra. Here we take our lunch break. In the afternoon we have a relaxing program. At a comfortable pace, we walk through the surprisingly green Wadi Nuqra to Jabal Um Ad Dami. We prepare you a dinner and stay overnight in a cave. Today we climb our second mountain, Jabal Um Ad Dami. The top is 1,854 meters above sea level which makes it our country’s highest mountain. On the way up we have the opportunity to see wildlife. Foxes, rabbits and gazelles are spotted here frequently. From the top, you have the best view on the desert of Wadi Rum. Additionally, you can see parts of the Saudi Arabian desert on the horizon and also the Red Sea’s blue waters. After taking our time to enjoy the views we start our descend. Ones we are back on the valley floor it is time to take today’s our lunch break. In the afternoon we explore the big Wadi Sabet. In the past Bedouin organised camel races in this valley. Of course, we take plenty of time to enjoy the valley views. Tonight we have dinner and stay overnight in this valley. This morning we leave Wadi Sabet and walk to lovely Um Ghdah. Um Ghdah is a small canyon dotted with trees. Here we look for a nice and quiet place to have lunch. After lunch, you can explore this canyon some more by yourself. When it is time to go we head to the double bridge called Um Ashaman. Of course, we take the time to climb the double bridge. It is close to the ground and easy to climb. Tonight we have dinner and overnight close to the double bridge. This morning we do another beautiful walk. Our destination for today is Um Sabatah. On the way there we visit one of the Bedouin dams. This is also the place where we have our lunch break. In the afternoon we continue our walk to the red desert of Um Sabatah. Around sunset time we arrive at an excellent place to enjoy the sun setting over Wadi Rum desert. Dinner and overnight is also in Um Sabatah. We leave the red desert and walk to Um Fruth rock bridge. You can climb this bridge and enjoy the views of this part of Wadi Rum desert. Nearby we find ourselves a good place to have lunch and relax. In the afternoon we leave the Um Fruth area. We pass by some stunningly beautiful places as we are on our way to today’s destination Khashkhasha canyon. In this beautiful place, you can enjoy one more sunset while we prepare you another Bedouin dinner. We enjoy our last night under the starry night sky. Wake up in time to enjoy your final Wadi Rum sunrise. After breakfast, we break up and start our walk to Khazali canyon. We enter the canyon to go and see the ancient inscriptions and the water hole. Nearby the canyon we find ourselves a shady and quiet place. Here we stay for a few hours and have lunch. In the afternoon we walk to Rum village. We arrive here around 3 PM. From here you can continue your journey. Of course, we can help you to arrange transportation to your next destination. This price includes a Bedouin trekking guide, a cook, a jeep, all mentioned meals, drinks and sleeping equipment. Our trekking prices are based on shared touring. Our maximum group size during the tour is ten persons. For bivouac camping, the maximum group size also is ten persons. We determine your price based on the number of people who are in your booking. Prices for five or more persons are available on request. Prices for a private trekking are also available on request.